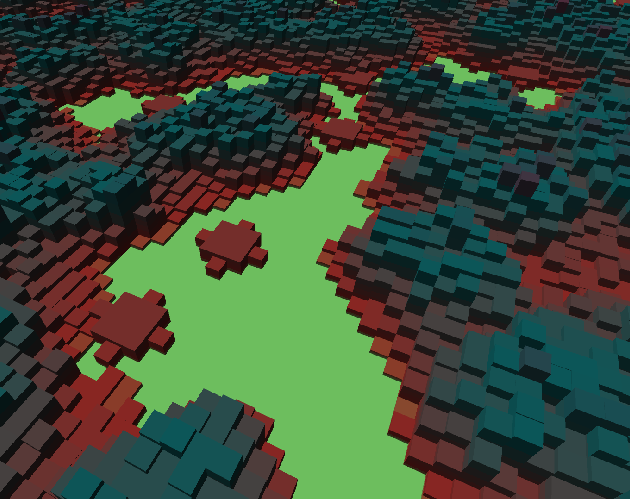 This small interactive generates landscape-like forms by accumulating the states of a cellular automaton over time. 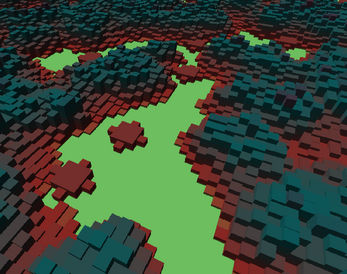 This work was inspired by @samturnagedev's lovely cellular automata terrain, also being developed for this PROCJAM! May not run on older GPUs - let me know if you have an issue and I'll see if it can be improved! Since the color gradient and CA rule are random, they may not be interesting all of the time - try and try again, or, for the CA rule, manually enter a known one. Stains, B3678/S235678, is one of the first I tested with, and it still holds up! Spawn Probability influences how much of the grid is alive at first - it can impact automata in varying ways, so just tinker around a bit. An old (but well-rounded) list of interesting rules to try - note that the rule notation is S/B, versus B/S in-game - this has caught me out a bit! A .zip archive containing the necessary files is provided: simply extract this and run the executable.